Pop art styled Bollywood movie poster of the blockbuster Hindi film Mr. Natwarlal (1979) for sale. This is an actual surviving Bollywood pop art poster of the 1979 film that featured the biggest superstar of Indian cinema, Amitabh Bachchan in the lead role. Printed and circulated somewhere during the release of the film, this quirky vintage movie poster was originally designed for publicity of the film but never ended up being used. This Bollywood pop art poster was originally designed by cutting out images of actors from separate still photographs (shot on set location) and pasting them on a board. The background and typography are hand drawn / hand painted, which makes this Bollywood pop art poster an interesting mix of two very different design techniques. The poster features a hand painted portrait of Amitabh Bachchan in the center in an action pose, along with a smiling Rekha on the side. The typography used in this poster is primarily English, with a translation of the title added in Devanagari Hindi at the bottom. 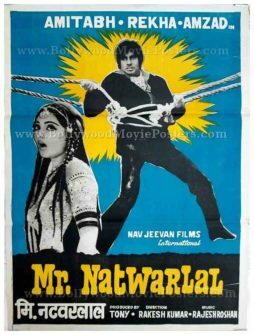 Mr. Natwarlal is a 1979 Hindi blockbuster inspired in parts from the real life story of the notorious conman of India, Natwarlal. The film stars the biggest superstar of Bollywood, Amitabh Bachchan in the lead role, along with Rekha, Ajit and Amjad Khan. The film was shot mainly in Kashmir. This was the first Hindi film in which Amitabh Bachchan sang an entire song, proving to be a massive hit amongst his huge fan base. Subsequently, this concept was mimicked by filmmakers in later films giving Amitabh Bachchan an opportunity to lend his voice to some of the most memorable songs in Bollywood. Quirky, hand painted old Indian cinema poster of the blockbuster Hindi film Mr. Natwarlal (1979) for sale. This is an actual surviving poster of the 1979 film that featured the biggest superstar of Indian cinema, Amitabh Bachchan in the lead role. Printed and circulated somewhere during the release of the film, this hand painted old movie poster was originally designed for publicity of the film but never ended up being used. This old Indian cinema poster was originally designed on a hand painted canvas, making it very collectable. The poster features Amitabh Bachchan and Rekha locked in a romantic gaze on the top half of the poster. 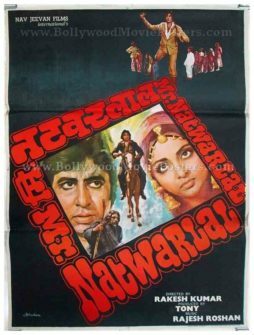 On the bottom half of the poster, Amitabh is depicted in an action pose, riding a horse. The typography used in this poster is English along with the translated title in Devanagari Hindi. Quirky, hand drawn old Hindi film poster of the blockbuster Bollywood movie Mr. Natwarlal (1979) for sale. 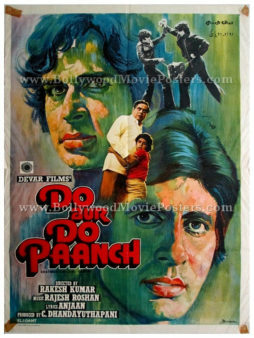 This is an actual surviving old film poster of the 1979 Hindi film that featured the biggest superstar of Indian cinema, Amitabh Bachchan in the lead role. Printed and circulated somewhere during the release of the film, this hand painted old Hindi film poster was originally designed for publicity of the film but never ended up being used. The poster features a hand painted portrait of Amitabh Bachchan in the center in an action pose, along with a smiling Rekha on the side. The typography used in this poster is Devanagari Hindi. 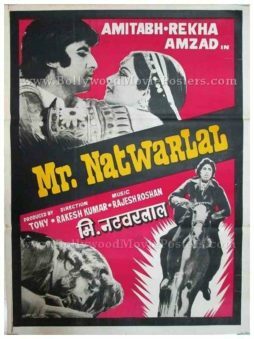 Highly collectible, hand painted vintage Bollywood movie poster of the blockbuster Hindi film Mr. Natwarlal (1979) for sale. This is an actual surviving vintage poster of the 1979 film that featured the biggest superstar of Indian cinema, Amitabh Bachchan in the lead role. Printed and circulated somewhere during the release of the film, this hand painted vintage movie poster was originally designed for publicity of the film but never ended up being used. An interesting first, Diwakar has chosen to opt for very prominent and almost 3D styled typography for the film’s title, which is seen dominating the center of the poster. The title of the film appears thrice on the poster in both Devanagari Hindi as well as English language. The highly unique usage of fonts makes this hand drawn poster by Diwakar a one of a kind collectable.